Why would I need self storage in Tucker, GA? There are a variety of reasons why you might need self-storage in Tucker, GA.
How much is a storage unit in Tucker, GA? The cheapest storage unit in Tucker, GA is $34.00 per month. What size storage units do you have available in Tucker, GA? In Tucker, GA we have sizes that range from 5'x4' to 20'x45' to suit your storage needs. How much is it for a 5'x4' storage unit in Tucker, GA? The cheapest 5'x4' storage unit in Tucker, GA is $36.00 per month. Tucker is a thriving community in the metropolitan area of Atlanta, Georgia. Home to a diverse population in which nearly one in five residents is born outside the United States, Tucker is popular with young families, working professionals and retirees alike. The city only recently received its official incorporation, passed by voters in 2015. In the early 1800s, the governor of Georgia gave military veteran Greenville Henderson 3,000 acres of land as a reward for his services ? land where the city of Tucker now sits. Henderson used the land to establish corn-fields and apple and peach orchards, as well as a successful whisky and brandy distillery. The area served as a Union soldiers' camp during the Civil War, and many buildings and transportation routes were destroyed. For several years the area remained quiet as the remaining locals worked to rebuild. Population growth was modest until 1892, when the Georgia, Carolina and Northern Railway Co. built a railway through the town. Tucker was just one of several small villages constructed around the depots that dotted the railroad, each one named for a different railroad official. After World War II, Tucker evolved from a rural agricultural community to a well-rounded town with residential, commercial and industrial developments. The arrival of several large companies in the area propelled the city toward growth, and much of the land was subdivided and sold for further development. 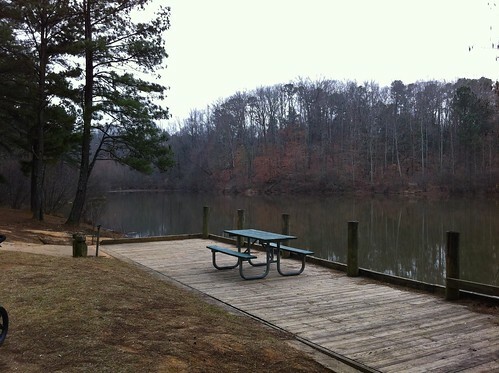 By the 1960s, Tucker was nicknamed "DeKalb?s Area of Golden Opportunity" and became an increasingly popular place through the second half of the 20th century. New residents have been flocking to the tight-knit city of Tucker in recent years, attracted to its community spirit, local parks and proximity to Atlanta. Community involvement is a major tenet of life in Tucker, with local organizations ranging from business and community improvement to arts and culture. The city's Main Street is host to many community events. The Tucker Day celebration has been a city tradition since the 1950s and features a Main Street parade, live musicians and food vendors. Other special events that take place on Main Street include a local chili cook-off and Taste of Tucker. While unemployment in Tucker is slightly above the national average, job growth in the community has been positive. This positive job growth may in part be inspired by Tucker's highly educated population. Despite Tucker having no university of its own, its residents are some of the best educated in the United States. Nearly half of the local population hold bachelor's degrees, which is well-above the national average. Many Tucker residents work in management, sales and office and administrative support positions. There are also more Tucker locals working with computers and math than in most American cities. You can also take advantage of the proximity to Atlanta and other locations in the Atlanta metropolitan area, which provide further job opportunities. The DeKalb County School District oversees the public schools in Tucker and many neighboring communities. There are also a few private schools in the area, if you're looking for an alternative to public education. Utilities: Georgia Power provides electricity to the homes and businesses of Tucker. DeKalb County manages local water and sewer services. Garbage and Recycling: Advanced Disposal provides disposal services to most residential areas of Tucker. Transportation: Tucker is served by the large MARTA transit system, which provides a network of routes accessing Atlanta and many other Georgia cities. The median home price in Tucker is above the national average and slightly more expensive than the averages for the greater Atlanta metro area. Home appreciation in Tucker has been significant in recent years, so you may be able to make a good investment. Choose from retro split-level and ranch-style homes or multi-story dwellings, all located close to schools, parks and churches. Our lowest priced units in Tucker, GA average $39.20 per month. 386 people have reserved units in Tucker, GA in the past 30 days. There are 10 locations within Tucker, GA's city limits. There are 2 locations in Tucker, GA that offer AC and Heating features.